Long-time fans of Motocross and Supercross racing will perhaps remember the first appearance of the Shift brand, prominently displayed on the riding gear of one-time star rider Jeff Emig back in the long-ago 1990s. In the last few years, while continuing to manufacture high-quality motocross gear, Shift has branched out into the on-road protective gear market. Their street gears stays true to the same principles that have defined their motocross equipment since the beginning: modern, edgy styling backed up by innovative design features. Despite the relatively recent rise in popularity of ‘textile’ riding jackets (those made from abrasion-resistant fabrics other than leather), many street riders still appreciate the comforting feel of a good leather jacket. Leather has a unique look and feel that is quite different from most textile products, and while the latest generation of textile jackets use space-age materials that are sure to perform well in a crash, there is still something comforting about having a thick layer of good old cowhide between your skin and the pavement. Still, there is one area where leather jackets fall behind their textile cousins, and that is weight. Leather, in the thickness used for protective riding equipment, is quite heavy, and a full leather jacket can be heavy enough to become fatiguing during all-day wear. To solve this problem, Shift came up with their Dyer Hybrid riding jacket and gloves, which combine traditional leather and modern textile materials to offer the feel and protection of leather, but with significantly lighter weight. Leather is used in the areas where a jacket would typically be subjected to an impact with the pavement, like the arms and shoulders, back, and chest panels. Meanwhile, the insides of the sleeves and the sides of the torso are covered with lightweight, but still abrasion-resistant KorMax Stretch Aramid fabric, which also offers greater flexibility (as the ‘stretch’ part of the name implies). The end result is a jacket which is claimed to be 25% lighter than a pure leather jacket – in fact, going purely by feel, I would guess that the Dyer jacket is probably more like 50% lighter than some of the leather jackets I own! 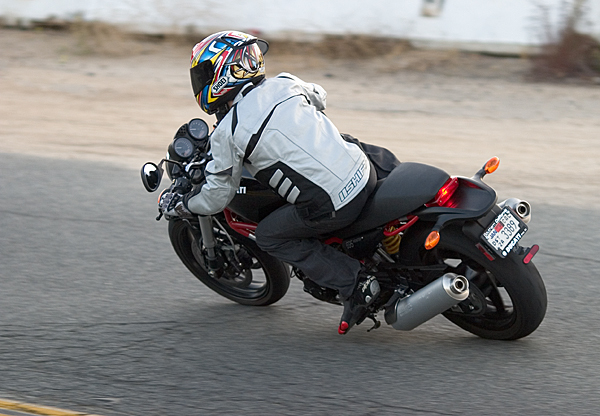 Of course, just because the Dyer is lighter than the average leather jacket doesn’t mean Shift skimped on protection. To back up the leather in the impact areas, the Dyer jacket features CE-certified semi-stiff foam armor in the shoulders and elbows, along with a flexible foam back pad. The foam back pad can be removed from the pocket built into the jacket and replaced with a sturdier back protector, which is a highly recommended upgrade for any jacket. Although there are some small breathable panels on the lower torso, the Dyer doesn’t pack much in the way of venting, and I definitely wouldn’t consider it a summer jacket… at least not in Southern California. However, as long as it is under 80 degrees, the Dyer is perfectly comfortable, and in the recent cool weather we’ve been blessed with out in SoCal, I didn’t miss the venting at all. For those really cold days, the Dyer comes with a removable quilted vest liner, which folds up small enough to stuff in the bottom of a tankbag or backpack, ready to keep you warm on that late-night ride home. The silvery leather of the Dyer jacket contrasts nicely with the black textile panels, giving an aggressive look that sets it apart from the typical black leather jacket (the Dyer is also available in black and red). The fit is excellent, with side adjustment straps that allow you to control the taper at the waist. The first few times I wore the Dyer, the leather sections were quite stiff, but they broke in quickly and are now quite flexible and comfortable. One nice feature is the tight fit at the wrists, which makes it easy to fit the gauntlet of a long, racing-type glove over the jacket – something that can be difficult with many street jackets, which fit too loosely at the wrist. 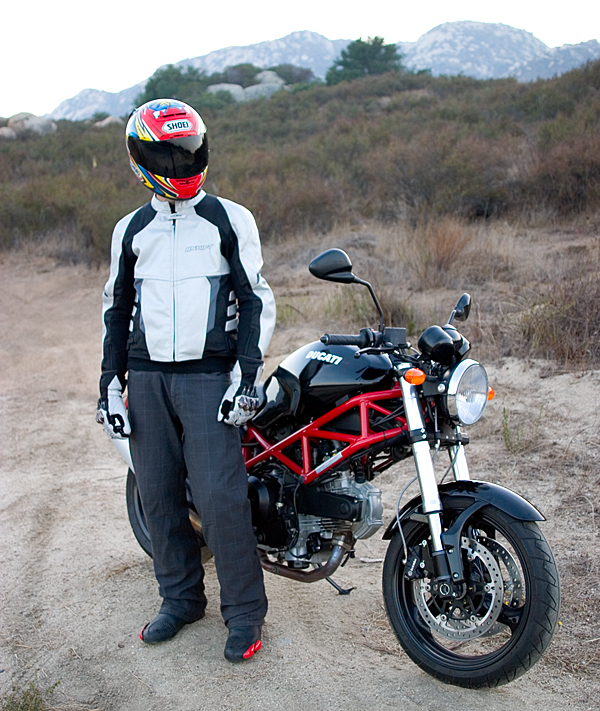 Speaking of gloves, Shift sent me a pair of Dyer Hybrid riding gloves to match the jacket. The Dyer gloves are long, gauntlet-style riding gloves, and feature the same hybrid leather/textile construction as the Dyer jacket. Protection is enhanced by the reinforced, padded leather palm, overlapping leather finger guards, and TPU armor on the knuckles and side of the wrist. The pre-curved fingers and soft, supple leather help the Dyer gloves break in quickly and painlessly, and they offer a good balance of protection and feel. The black textile and silver leather is set off by the ‘bronze chrome’ look of the knuckle and gauntlet armor, giving a cool look that is a nice change from the more common carbon-fiber knuckle guards. The gauntlet fits nicely over the wrists of the Dyer jacket, offering full-coverage protection for your hands and arms. For a company that hasn’t been producing street protective gear for very long, Shift is certainly catching on quickly. For riders looking for the protection of leather without the excessive weight, and who like the way Shift’s edgy style stands out in a crowd, the Dyer Hybrid jacket and gloves are an excellent option. The Dyer jacket and gloves carry a U.S. MSRP of $299.95 and $99.95, respectively. For more information, check out Shift’s offical site.